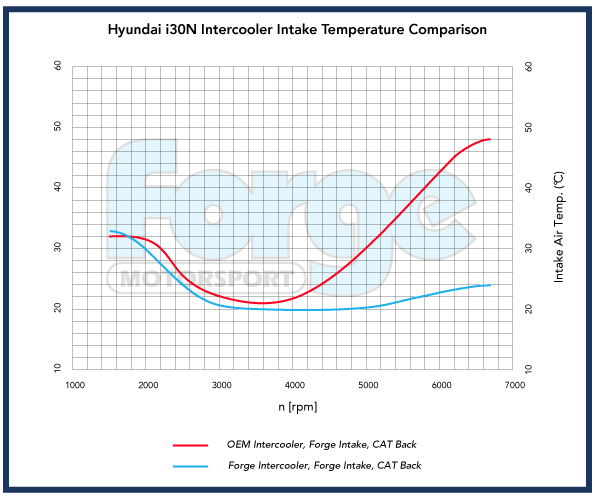 The Forge Motorsport front mount uprated intercooler for the Hyundai i30N. If you use a i30N for fast road or have a high performance tune in a hot climate, this product is essential. Utilising our industry leading bar and plate design alongside Solidworks CAD and flow simulation design (Computational Fluid Dynamics - CFD) to develop our high flow cast end tanks, the turbo side endtanks feature an internal divider to ensure the full volume of the stepped core is utilised. The bar and plate core has over 129% more volume and an increase of frontal surface area over 71% (over the stock cooler) meaning the Forge Motorsport intercooler is the largest currently available on the market. To ensure we deliver optimum cooling efficiency, the development team created a fabricated ducting system that has been skilfully integrated into the superior design of this product. The inlet and outlet sizes have been increased in diameter to 65mm, giving an increase of 27% more volume over the stock cooler to give perfect flow. The development team also added a custom hard pipe increasing the diameter by 14 mm to 64mm - up from the factory 50mm. This replaces the stock factory pipe on the hot side to ensure this package gives you all you need for maximum performance gains on high levels of tune. The boost pipe and intercooler come in our standard black textured finish powder coat for maximum longevity. During our extensive testing, we let the car heat soak on the dyno until the radiator fans tripped on and off (which gives an inlet temperature of around 40°C), we then did a dyno pull from this point, in doing this it gives a more consistent result and reflects real-world driving conditions more accurately. You can easily see the Forge intercooler cools much quicker and delivers a much greater drop in temperature compared to OEM. After more than six pulls on the dyno we still had super safe IATs and the Forge Motorsport intercooler gave results of 24°C, halving the factory’s intercooler intake temps from 48°C. These tests took place in relatively cold conditions with an ambient dyno cell temperature of 15°C proving how inefficient the stock intercooler is. In the summer months, the stock intercooler along with higher inlet air temperatures will have a hugely negative impact on the engine’s performance. In these conditions, the engine management will retard the ignition, resulting in a lower powered engine as temperatures rise and the ECU then pulls out the timing to stop detonation. On a mapped vehicle, the results will be even more detrimental and can lead to possible premature engine wear. This intercooler combined with our intake, and a quality aftermarket cat back exhaust will deliver you unparalleled levels of performance. 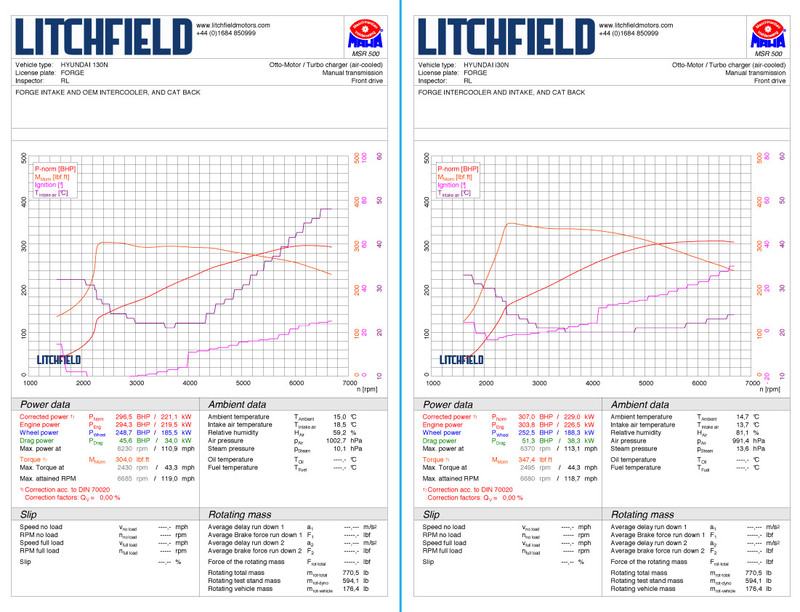 The final testing results were very notable - not only did the Forge Motorsport intercooler halve the IATS and significantly increase both power and torque over Hyundai’s claimed figures of 275bhp and 278lb.ft of torque, making an extremely impressive 307bhp and 347lb.ft. 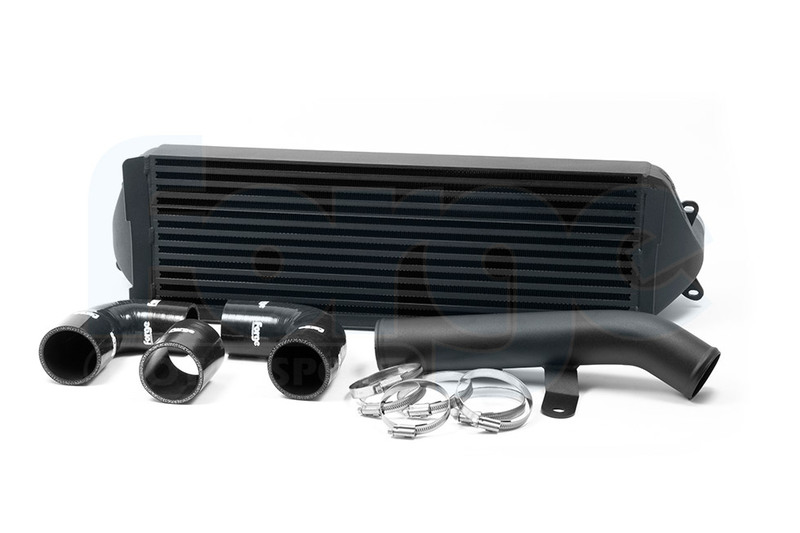 The Forge Motorsport front mount intercooler has all the necessary hardware to install the kit in approximately 2.5 hours depending on competency and tools available.